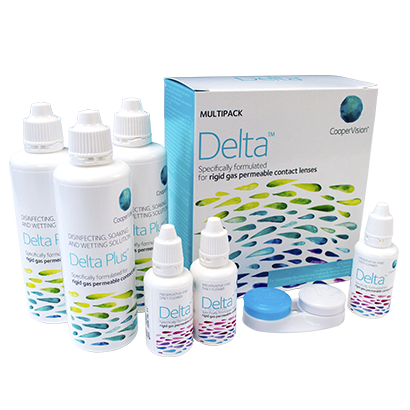 Review Delta Multipack Have been using Delta for years at the recommendation of my optician. Convenience is crucial when using contact lenses. After all, cleaning and wearing lenses can be a time consuming process. With this Delta Multipack, wearers of rigid gas permeable lenses can find the cleaning and disinfecting products that they require in one place. This handy all in one solution for RGP lenses will delight any user who need to save time and achieve excellent results. Produced by Sauflon, the Delta Multipack will save you both time and money. • The multipack comes in two sections. Firstly, the Delta pack includes the Daily Cleaner. This is an easy to use way to start the cleaning process by removing any dirt and grime from the contact lens without risking any damage in the process. • Secondly, the pack includes the DSW Solution. Lenses are bathed in DSW overnight, which contains polyhexanide - a superbly effective disinfectant which will leave lenses feeling like new in the morning. • Has a multi-functional purpose - cleaning, disinfecting and providing added moisture, for a true all in one package. • Intended to provide enough cleaning solution to last for three months at normal usage levels. With the Delta Multipack, users of RGP lenses will find the ideal combination of cleansing and disinfection. The easy to follow two-step process is also safe and effective. Anyone who relies on RGP lenses can benefit from this superb multipack.